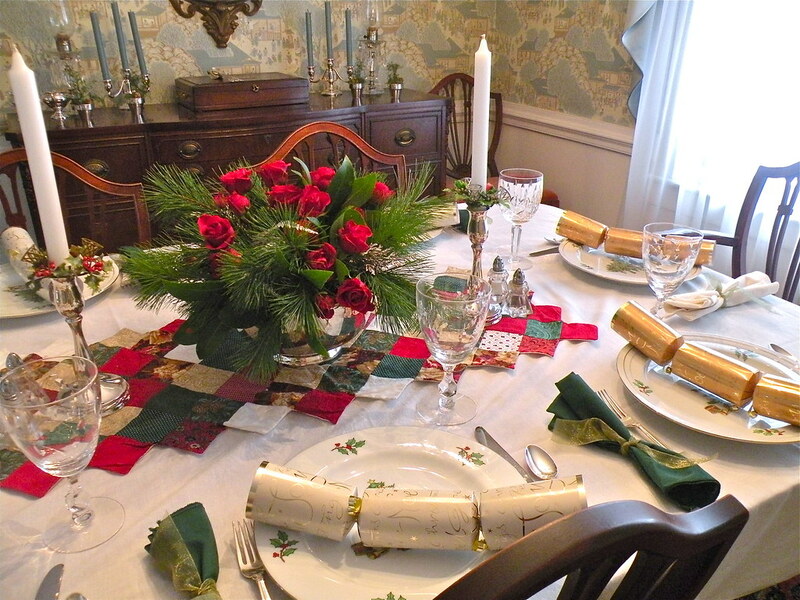 Last week, I shared my pics of the holiday house tour I was part of. 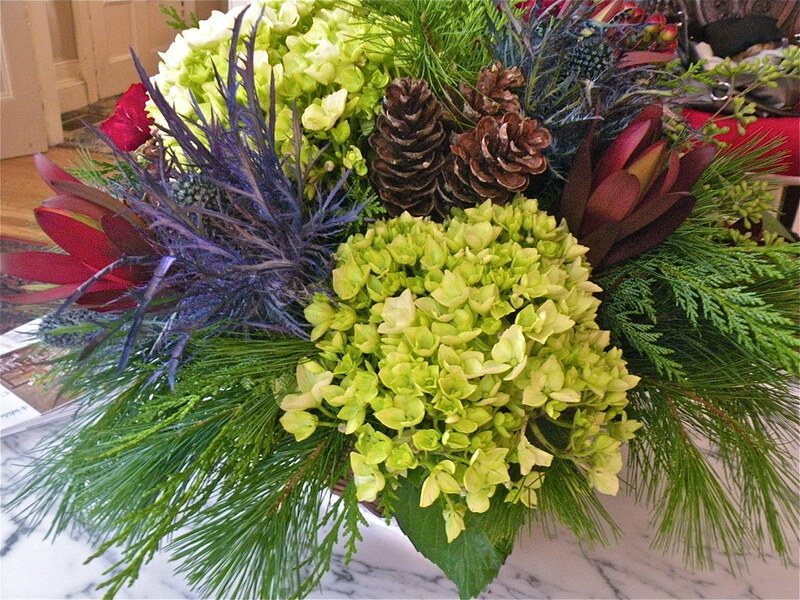 A local florist – East Sandwich Flower & Gift – had donated this beautiful floral arrangement. Luckily for me, the homeowner was going away for a week and so I was able to bring the arrangement home with me. The arrangement was quite large at around 15″ in diameter which made it too big for a table centerpiece or even on the counter. I love re-doing arrangements and really trying to wring as much life out of them as I can. 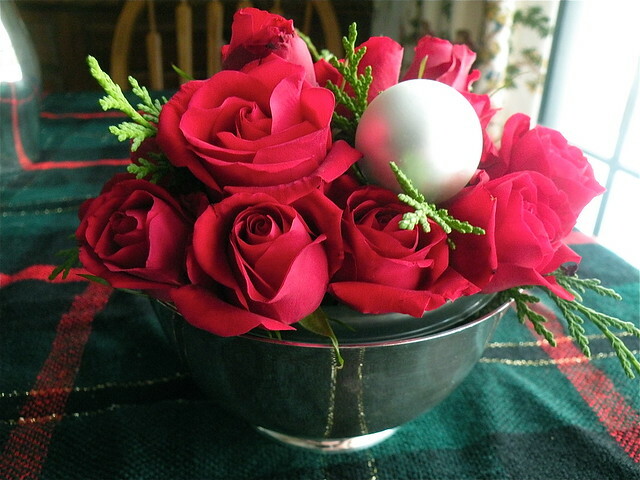 We held our family Christmas today as one of my brother’s was in town this week from Colorado and I was able to make 4 new arrangements out of the original one, with only the addition of new red tea roses. 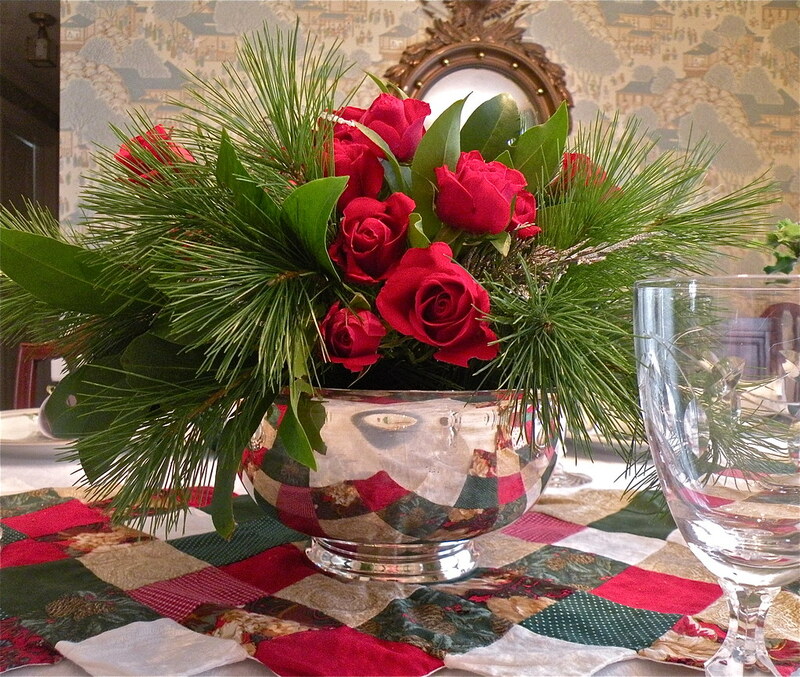 Here is the dining table centerpiece, using a sterling silver Revere bowl as the base. I reused the oasis from the original arrangement and put it in a plastic container in the bowl. I reused the white pine and flat leaves from the original arrangement, and added the new red tea roses and silvered pine as well. And the table all set for dinner. I almost took out one of the cut crystal goblets when I opened my Christmas cracker and a very sturdy bottle opener flew out. Of course, the entire family wore our paper crowns throughout dinner. The above is a mini arrangement I made (about 5″) in a mini silver Revere bowl, to which I added some of the flat pine from the original arrangement and some matte silver balls. The more casual arrangement above is made completely from the original arrangement. The tall deep red spikey flowers have darkened to a very deep red, but I like the rusticity of this one, which is on the kitchen table. 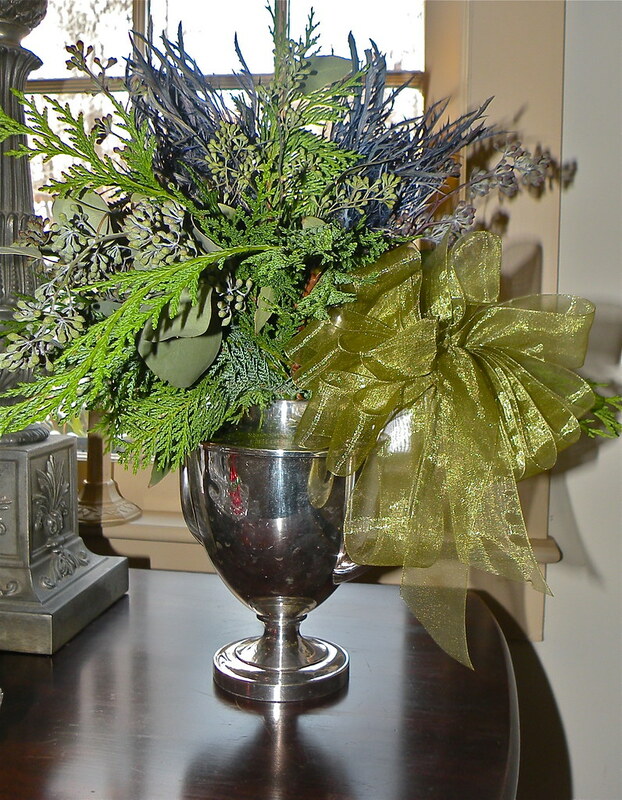 This arrangement – which I had a terrible time photographing – is a mix of the softer flat greens, flat leaves, green flowers and thistle. 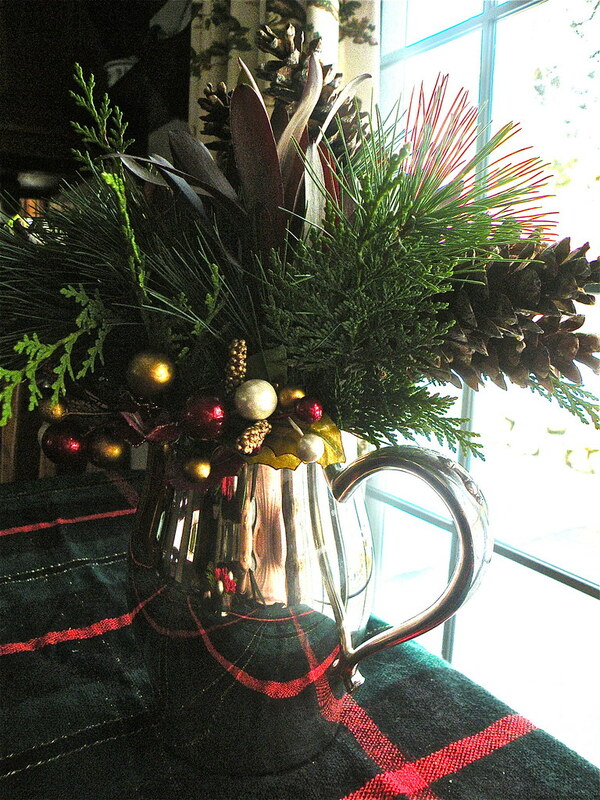 I used my Hell’s Kitchen Flea Market silver tea pot and added a big bow. Trust me, this is much prettier and kind of wild looking in person. 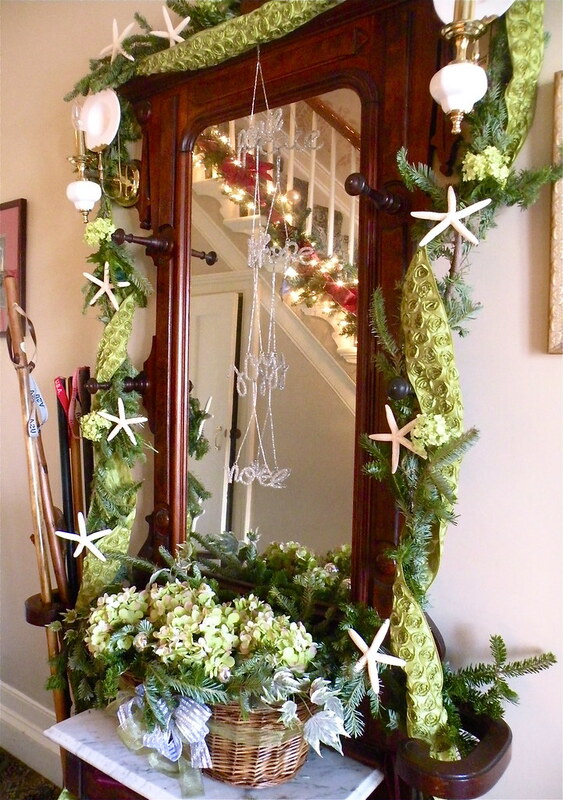 From the left over greens garland I used in the foyer of the holiday house, I made the simple arrangement below. 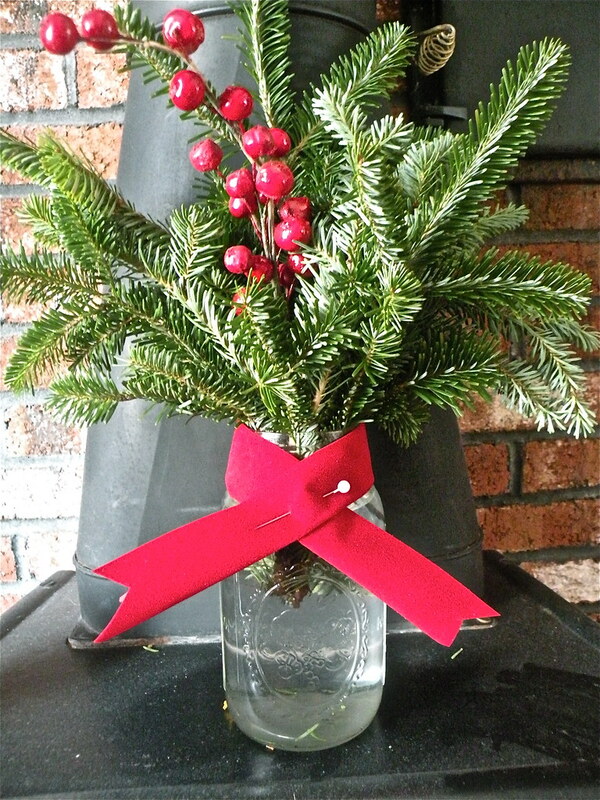 A simple Mason jar, filled with evergreen and berries, tied with a velvet bow. Couldn’t be easier. As I said, I like to wring every last bit of life out of a floral arrangement. Many people feel that flowers will just die, so why give them. 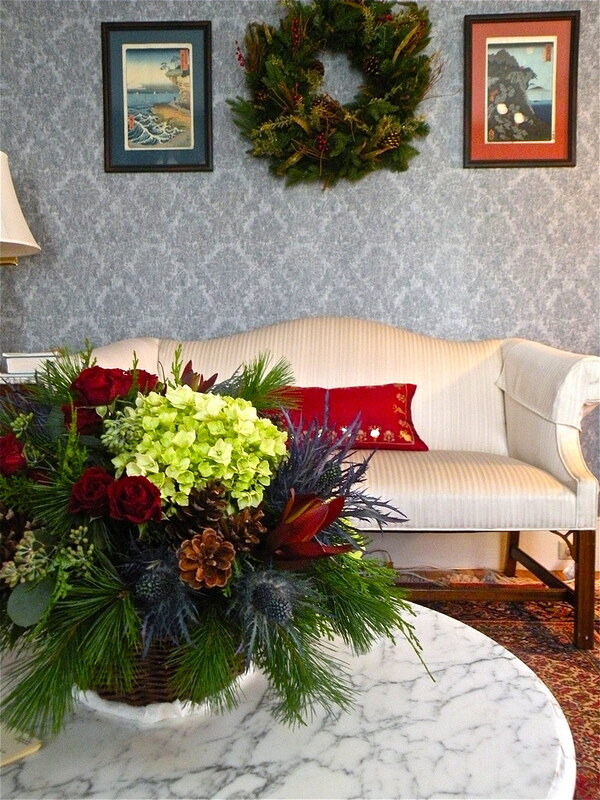 But it’s so easy to re-create and refresh an arrangement with a few new flowers and bits and baubles.